I read this article and found it very interesting, thought it might be something for you. The article is called Chris Haughton Interviewed and is located at https://www.totallydublin.ie/more/print/chris-haughton-interviewed/. Some of the best illustration is produced for children far too young to appreciate its skill. At their best, though, children’s books are good enough to be cherished by adults for their quirky design and keen wit. 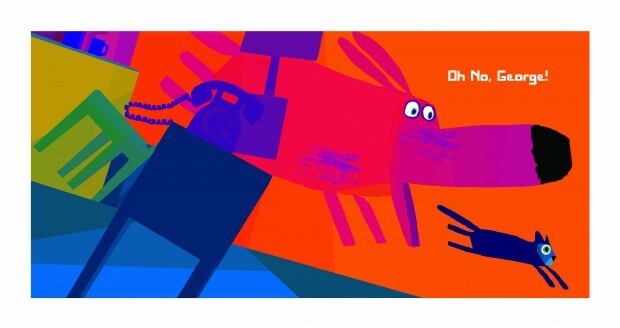 The Dublin-born, London-based illustrator Chris Haughton produces such creations – his two book projects so far, Oh No GEORGE! and A Bit Lost, both centre around animals who provoke very human emotional responses. We spoke to him about his pen-mastery, inspirations, and the makings of good design. You have a new book out, called Oh No GEORGE!. What’s it about, and how did the idea start off? Oh No GEORGE! is about a dog who tries his best to be good, but falls a little short. I began by drawing all sorts of characters messing up in different ways, starting with the idea of a clown and his dog getting into trouble, but I realised it would be funnier with just one comic character. I also liked the idea of building up the tension over two pages: George has seen a cake; George said he would be good, but that he really likes cake; what will George do, and when you turn the page… OH NO, GEORGE!!! George has eaten the cake. I love the concept of a ‘guilty dog’ – I have a dog at home that always looks very guilty, and consequently gets blamed for things he probably didn’t do. You also have a book about an owl that feels lost. If you were a disaffected animal, what would you be? My publisher asked me that same question when I finished my owl story – they asked which animal I thought I was from A Bit Lost. I said that I was maybe the lost owl, but my Art Director and Editor smiled at each other and told me that no, I was definitely the harebrained squirrel. I wasn’t so sure myself, but it seemed to be a strongly held opinion. There’s something very old-school about the comedy of calamity in ‘Oh No GEORGE!’, yet the design and approach to the subject feels very modern. What sources did you look at for inspiration? I used to live with a professional clown, and she introduced me to physical comedy which I found very inspiring – there’s something lovely about that silent, visual humour. Their timing and expression is very important, so I try to imitate that. I also studied graphic design, so have a soft spot for nice, flat colours and graphics. I love Leo Lionni’s artwork and Dr. Suess – I try to look at classic picture books for inspiration if I’m trying to figure out a scene. How have your book-production skills developed over the course of your two creations? Any important lessons you’ve learnt? I still find myself underestimating the time it will take. It looks quite a straightforward thing to do, but there are so many dead-ends, and so much backtracking – especially at the start. I have lots of ideas, but only a few can really tie themselves up as stories. When writing for very young children, I also think it’s important to rely on character, and keep it as simple as possible. You’ve also been working for the fairtrade clothing company People Tree. Are ethical considerations something you consider to be important to good design? Yes. I think ethical considerations are crucial to all good design. In trying to design something as well as possible, it’s always helpful to go right back, think about it from every angle and figure out how can it be better. If you think about that question long enough, it always comes back to ethical considerations. I got a bit disillusioned in my own design when I was doing advertising and branding for large companies, so I wanted to do something that was more rewarding. I think design has a great potential for positive change and I would love to be involved in that. It’s the exciting part! Are you going to be back in Dublin for Offset? If so, who are you looking forward to seeing talk? Yeah! I really like the work of KesselsKramer, so I will be definitely watching that one. Also, Seymour Chwast, Stefan Sagmeister Johnny Kelly and Kevin Waldron. There’s too many to name. What other projects are in the pipelines? I’m very excited about my third book, which will be called DON’T WORRY, I HAVE A PLAN. I’m very proud of the story in it, but who knows when it’ll be finished. Maybe by the end of the year. I’m also working on an interactive animated app called ‘Hat Monkey’, and I have a few non-fiction ideas too.